Reliable, mission critical audio conferencing. Compunetix has been designing and manufacturing communications solutions for nearly 50 years and are industry experts in high-quality audio for every conferencing need. From sensitive and secure calls to emergency alerting systems, we offer commercial quality conferencing to military markets. We offer a lifetime support guarantee along with 24 x 7 x 365 assistance, and we never manufacture discontinue our products. The scalability, reliability, and flexibility of Compunetix systems can expand your required conferencing solution into limitless communications possibilities. “It is required that all telecommunications devices / switches shall be joint interoperability certified by the Joint Interoperability Test Command (JITC) and granted information assurance (IA) certification and accreditation by the Defense Information System Network (DISN) and Designated Approval Authorities (DAAs)” in order to be valid for purchase within the Department of Defense. Joint Interoperability Test Command (JITC) is DISA’s test and evaluation execution arm with the mission to enable the rapid acquisition of Joint Information Technology (IT) / National Security Systems (NSS) warfighting capabilities. JITC testing ensures only proven capabilities are placed in the hands of our Nation’s warfighters. Where does Compunetix fit in? In the DOD marketplace, Compunetix has been certified by the Joint Interoperability Test Command (JITC) as an approved product that can be legally connected to the Defense Switch Network (DSN). Compunetix is in the unique position of being JITC compliant with Avaya and Nokia Siemens switches, among others, approved for use on the DSN. Compunetix is also used by Government Civilian Agencies who desire to control their own conferencing asset while still utilizing the advanced features they have become accustomed to via their Conference Service Providers. Compunetix also provides mission critical conferencing equipment for Military Command and Control as well as missions within the US Intelligence Community. STE Secure conferencing, RED-BLACK mission voice, and intelligent touch screen keysets are just a few of the offerings. Let Compunetix customize a comprehensive, convenient, and reliable method of collaboration that will allow you to re-examine how conferencing can work for your agency. We’ll keep you up and running with interoperability compliance. Compunetix boasts the industry best five nines reliability rating in voice quality. 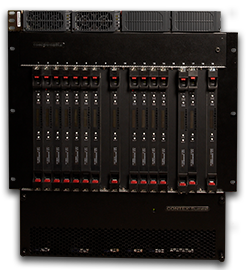 Built with carrier class specifications, Compunetix JITC solutions are regularly trusted in high stress environments. Mean Opinion Scores (MOS) have been used for decades in telephony networks to obtain the human user’s view of the quality of the network. It is a numerical indication of the perceived quality from the users’ perspective of received media. Perceptual Evaluation of Speech Quality (PESQ) is a family of standards comprising a test methodology for automated assessment of the speech quality as experienced by a user of a telephony system. 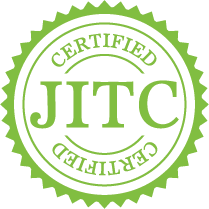 The JITC certified ConferenceManager2 is a state-of-the-art, on-premise audio conferencing platform engineered to deliver a highly secure audio conferencing solution for the Department of Defense. The system is compatible with all APL-listed voice switches and offers unmatched operational flexibility (supporting ad-hoc and scheduled conferences, as well as pre-set blast dial sessions).